Please find the flyer with reply slip enclosed for event details. If you are interested to sponsor and join the event, please return the completed reply slip by email: arischiu@acra.org.hk on or before Monday, 20 Nov 2017. 6-hour CPD certificate will be provided. For protecting our ozone layer & climate, most of common refrigerants with high ozone depletion potential and global warming potential have been or are being phased out. Government, Developers, Consultants, and Contractors are loving to see new generation refrigerants coming to the market asap. In this seminar, we are honorable to invite 3 experts to discuss various new refrigerants that may be used in industrial, commercial, and residential building. Participants can know more about the history & evolution, and the comparison of existing options with some new options including efficiency, flammability, changes to equipment, components and working procedures. Recent incidents and accidents along with application trends will provide the back drop to discuss the refrigerant handling & risk management. Relative standards, regulations and legislations will be also discussed. Details refer to attached flyer. For reservation, please complete the “Online Registration Form” or at the following “https://goo.gl/VWQhyY” , Limited seats, enrollment will be accepted on first-come-first served basis. After Online Registration, please complete and return the attached application form with a crossed cheque payable to “ASHRAE Hong Kong Chapter” to the P.O. Box 35612, King’s Road Post Office, North Point, Hong Kong before 27 November 2017 (Monday) and attention to Mr. Joe Chow. We are pleased to have Ritech Engineering & Supply Co LTD. to sponsor the 2017 ACRA Golf Tournament (WEG MOTOR CUP) on 1 December 2017 at PHOENIX HILL. Congratulation to below winner and thanks all golfers’ enthusiastic participation! Our largest event of the year, the 56th ACRA Anniversary Dinner has been hosted at the InterContinental Hong Kong on 27 November 2017 to celebrate the accomplishments ACRA has made for the industry. We are grateful to have invited Mr. SIT Wing Hang, Alfred, JP, Director of Electrical and Mechanical Services Department as our Guest of Honour to deliver us a professional and informative speech regarding the subject of air conditioning industry. The event received overwhelming reponse with over 650 industry insiders joining to witness the success of ACRA. This course is designed to broaden knowledge of engineers in relation to Building Services Systems and is useful for young engineers and practitioners who want to refresh / acquire knowledge in the design, installation and maintenance of these HVAC systems. A CPD certificate (with 2-hr) will be provided. A full course certificate will be issued to those who have applied for full course. Please refer to the attached flyer for full details. Registration will be on a first-come-first-served basis. Only online registration is accepted. Please find the flyer with reply slip enclosed for details. We look forward to hearing from you and your generous offer of help! We are pleased to have Midea Electric (Hong Kong) Limited to sponsor the ACRA Darts Competition 2017 (Midea Cup) held on 19 September 2017. Congratulation to below winners and enthusiastic participation of all participants! A fun night out on 21 June 2017 at the Happy Valley Racecourse! In addition to the on-track thrills, the evening’s excitement also included authentic delicacies and fine wines. Furthermore, there was a game ‘Horse Racing Competition ( 賽馬大亨計獎金比賽 )’ throughout the evening. Congratulation to below winners! ACRA, ASHRAE HKC, HKAEE and HKRVCA are jointly organised a 4-day Technical Visit from 11 to 14 April 2017 to Shanghai. In this occasion, our visiting team will visit the China Refrigeration Expo 2017 and some job sites as well as factories. 14 Apr 2017 (Fri) - Job site or factories visit and to Shanghai Int’ll Airport and H.K. The maximum number of participants is 30 and application will be accepted on a first-come-first-serve basis. You are strongly encouraged to make prompt registration, to facilitate the booking of air tickets and hotel rooms, by completing the Registration Form (one per participant) and returning it to info@acra.org.hk or fax at 2598 0102 by 23 Mar 2017. 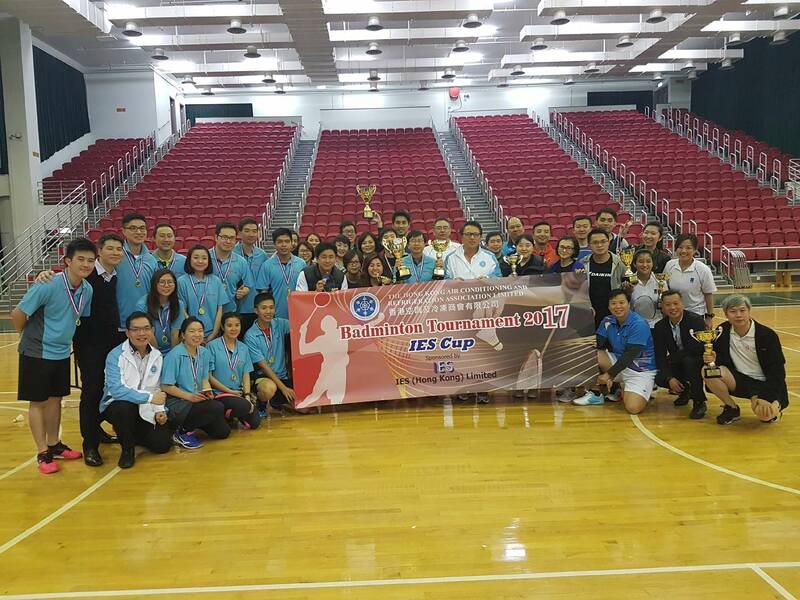 We are pleased to have IES Engineering (Hong Kong) Limited to sponsor the ACRA Badminton Tournament 2017 (IES Cup) on 21 and 28 February 2017 at Southorn Stadium. ACRA is organizing a 4-day technical visit to Japan from 1 to 4 March 2017 jointly with Macau Air-Conditioning & Refrigeration Chamber of Commerce (MARCC). In this occasion, our visiting team will visit some factories and job sites as well. The maximum number of participants is 30 and application will be accepted on a first-come-first-serve basis. You are strongly encouraged to make prompt registration, to facilitate the booking of air tickets and hotel rooms by 13 Jan 2017. Please click HERE to view visit details & application form.